By Lauren Carroll on Monday, November 10th, 2014 at 4:16 p.m. In January, the Republicans will take control of the U.S. Senate, as well as shore up their majority in the House of Representatives. What will they do with their newly won power? House Speaker John Boehner and soon-to-be Senate Majority Leader Mitch McConnell have laid out some of their top legislative priorities. It’s a range of issues -- everything from dismantling the Affordable Care Act to passing international trade agreements, and shutting down the possibility of another government shutdown. The GOP leadership didn’t campaign on a formal agenda, instead unveiling their priorities after they won the Senate majority. We want to take note of Boehner and McConnell’s goals now so we can revisit them in 2016, at the end of the 114th Congress, and see what was accomplished, what fell apart, and where Republicans compromised. Authorize Keystone XL: Authorizing the oil pipeline might be one of the first things to happen. Boehner and McConnell called for it in a Nov. 5 Wall Street Journal op-ed outlining their plans. At a press conference the same day, Obama talked about the pipeline but didn’t say whether or not he would go forward with authorization. Republicans and some red-state Democrats support constructing the oil pipeline, which would stretch into the United States from Canada, but Obama has avoided taking a firm stance on it for years. Critics oppose the pipeline largely because of environmental concerns, but supporters say it will create jobs. In June, Boehner said delaying the pipeline costs Americans 100,000 jobs, and we rated that claim False -- the estimates are quite a bit lower. Repeal Obamacare: In their Wall Street Journal op-ed, Boehner and McConnell said they are "renewing (their) commitment to repeal Obamacare." Every new Republican Senator who won last Tuesday pledged to repeal and replace the law, but Boehner and McConnell control the legislative agenda, and it’s not clear how far they’re willing to go. In an October interview with Fox, McConnell said it would be near impossible to fully repeal Obamacare because they wouldn’t have enough votes in the Senate to overcome a Democratic filibuster, and Obama would veto it. 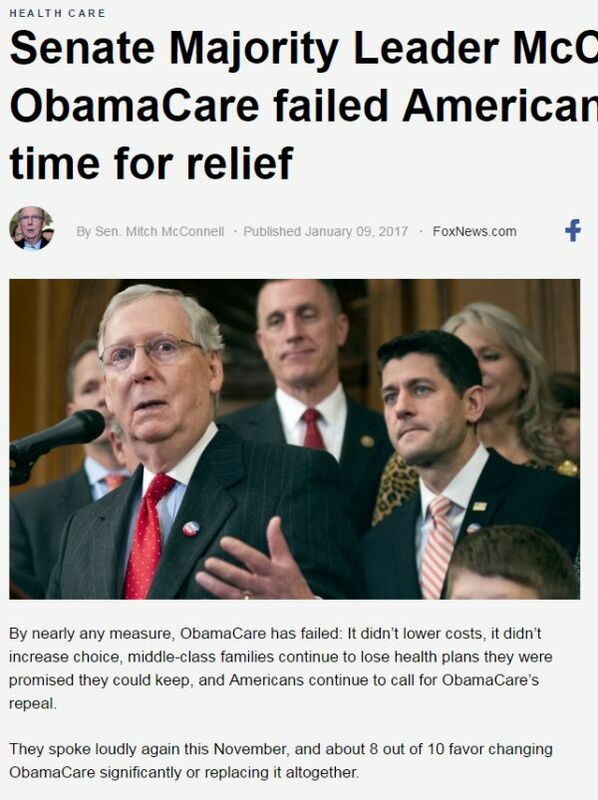 Time magazine interviewed McConnell the day after the election and reported, "Notably, a full repeal of Obamacare was not on (McConnell’s) mind, but rather a partial repeal through the appropriations process." McConnell said his priorities are "repealing the medical device tax, trying to restore the 40-hour work week, trying to get rid of the individual mandate." Veterans: McConnell and Boehner want to pass the Hire More Heroes Act, which is designed to boost veteran employment. The health care law requires businesses with 50 or more employees to provide health insurance. The Hire More Heroes Act, which has already passed the House, would let businesses hire veterans without them counting toward that 50-employee threshold, as long as those veterans already have health insurance. International trade: McConnell has also said he expects to find common ground with Obama on international trade agreements -- likely referencing the Trans-Pacific Partnership, which has support from Obama and many Republicans, but faces Democratic opposition. Tax reform: Along with international trade, Obama discussed possible corporate tax reform with McConnell when he called to congratulate McConnell on his election night win. Boehner and McConnell wrote in the Wall Street Journal that the tax code is "insanely complex" and "driving American jobs overseas." Both Obama and Republicans are interested in lowering the corporate tax rate, but the two parties are split on other possible changes to the tax code. Immigration: Immigration reform plans -- a hot issue throughout the election -- have been notably absent from this discussion so far, with McConnell avoiding the question in his Time interview. He did, however, say he plans to thwart potential executive action on immigration by passing appropriations bills that would limit funding for such actions. Energy: McConnell similarly plans use spending bills to counter executive action related to energy, such as Environmental Protection Agency coal regulations -- he told the Lexington Herald-Leader that his top priority is "to try to do whatever I can to get the EPA reined in." In the Wall Street Journal op-ed, Boehner and McConnell called for "legislation to help protect and expand America’s emerging energy boom." Government shutdown: Sending Obama appropriations bills that he is likely to veto (such as one that would limit executive action on immigration or energy) and delaying funding for Democratic priorities is a potential recipe for gridlock and another government shutdown. McConnell said, though, "No. There is no possibility of a government shutdown." Education: This goal is pretty vague, but Boehner and McConnell said they would consider bills that support "innovative charter schools around the country." Taking the entire agenda into account, some Tea Party Republicans think McConnell and Boehner are already going too far in compromising with Obama, especially by removing a government shutdown as a point of leverage, and even broaching the possibility that they might not fully repeal Obamacare. Whether the Republican caucus can reach agreement between its more establishment and tea party wings remains to be seen. So even though Boehner and McConnell’s goals might seem attainable now that their party controls both chambers, they still face friction within their own party and a Democratic president. We’ll return to this list in 2016 and see what came of it.